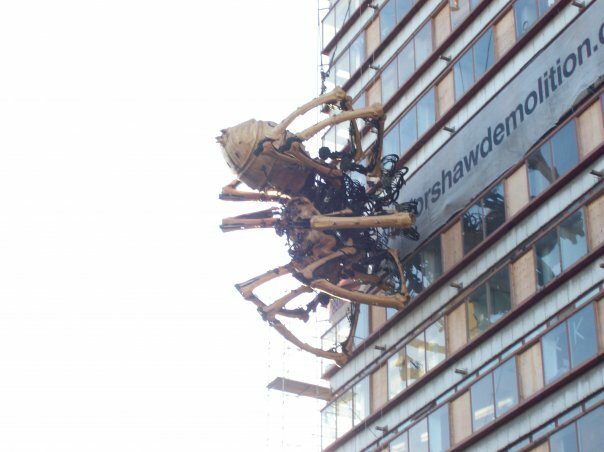 Posted by liverpoolchamber in 2008, Capital of Culture 2008, Culture, Events, Liverpool, World Wide Web. Quick! Get a rolled up newspaper! Crouching on the side of Concourse Tower is Liverpool’s latest resident, La Princess. 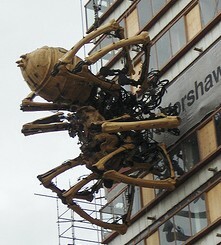 She’s been created by La Machine to creep her way through the city over the coming weekend. We’ll be rushing up there later to gawk at her like slack-jawed yokels. That pic was lifted from the Facebook group. More pics over there. The BBC has a detailed route and itinerary for La Princess here. Posted by liverpoolchamber in 2008, Capital of Culture 2008, Culture, Events, Liverpool, Travel. Visitors to this year’s Tall Ship Races event are being urged to use public transport and avoid peak time travelling wherever possible. Access by public transport is good to the two key sites of the event, Albert Dock and Wellington Dock and a range of public transport options are in place to get people to and from the Mersey River front. The easiest way to get to the Tall Ships event will be by train. There are around 5,000 free park and rides spaces across the Merseyrail network. Enhanced rail services will be in operation throughout the event, with trains every ten minutes at peak times. Rail passengers should get off the train at James Street, Central or Moorfields on the city centre loop line for access to the Albert Dock. Passengers should get off at Sandhills Station on Merseyrail’s Northern Line for Wellington Dock. The Northern Line has great links with trains connecting at Lime Street Station, Liverpool Central, Liverpool South Parkway and Southport. The advice is to use Central Station or Moorfields to get onto Northern Line from the City Centre. From Friday 18th July to Saturday 19th July, there will be six strengthened trains (six cars) every hour during the peak hours (6.30am to 10.30am and 4pm to 8pm) on the Southport line for visitors travelling to/from Liverpool city centre and Sandhills (for Wellington Dock) to view the tall ships in dock. In between these hours the frequency will be three trains every hour, also made up of six cars. Trains on the Ormskirk and Kirkby lines will be all six-car services and run three times every hour. On Sunday 20th July, strengthened Southport line services will again run six times every hour during the peak hours (7am to 10.30am and 4.30pm to 8pm) and four times per hour during the rest of the day. Trains on the Ormskirk and Kirby lines will operate a normal Sunday service (two strengthened trains every hour). Wirral line services will operate a Saturday service and, wherever possible, will operate as six car trains. Enhanced rail services will be in operation to the Wirral and Southport coasts for the best views of the Parade of Sail on Monday 21st July. On Monday trains will operate to their normal frequencies across the Merseyrail network (mostly four trains per hour) with all Southport line trains made up of six cars. There will be additional trains on the New Brighton line (eight trains every hour) between 3pm and 7pm for spectators who want to view the spectacle from the Wirral side of the Mersey. Existing bus services will be in operation, subject to some adjustments due to road closures. Contact Traveline Merseyside for the latest information on bus services in Merseyside during this event – 0871 200 22 33. A regular shuttle bus service will operate from St Nicholas Place opposite the Crowne Plaza Hotel to Wellington Dock on Regent Road. The service, operated by Arriva North West and Merseytravel, will be fully accessible. These buses will run from 10am until 10pm on the Friday, Saturday and Sunday of the race. On the Monday, a shuttle bus will take passengers from Hamilton Square Station on the Wirral line to Seacombe, one of the recommended viewing areas. Buses will not run to Wellington Dock on Monday 21 July as the ships will move from their berths to the River Mersey for the Parade of Sail. 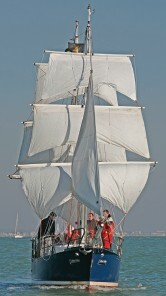 Mersey Ferries will be providing extra services on the Friday, Saturday and Sunday of the Tall Ships. Services will be extended into the evenings and two vessels will be operating on all three days. On Friday 18th July, normal direct services will operate between Seacombe and Pier Head from 7.20am to 9.50am. From 10am until 3.30pm River Explorer cruises will operate every half hour from Pier Head, Seacombe and Woodside. Direct services to all three terminals will then again continue from 4.15pm to 8.55pm. On Saturday 19th July and Sunday 20th July direct services will operate between Seacombe, Pier Head and Woodside from 8.05am to 9.45am. Then from 10am until 6pm on both days River Explorer cruises will operate every half hour from all three terminals. Direct services to all three terminals will then again continue from 7pm to 8.40pm. On Parade of Sail day, Monday 21st July, Ferries will depart every ten minutes between Pier Head and Seacombe from 7.20am to 10am. Between 10am and 10.50am direct services will continue every 20 minutes. Due to the closure of the river to all vessels not involved in the Parade of Sail, the will be no ferry services from 10.50am through to 5.55pm. From 5.55pm direct services will begin operating between all three ferry terminals every ten minutes. Last services are 8.25pm (Seacombe to Woodside and Liverpool), 8.35pm (Woodside to Liverpool) and 8.45pm (Liverpool to Seacombe). Visit www.merseyferries.co.uk for full details. Both Mersey Tunnels will be operating throughout the event and there are no planned closures. For information on all modes of transport contact Merseytravel’s Traveline team or visit the websites below. Posted by liverpoolchamber in 2008, Capital of Culture 2008, Events, LiveOne20, Liverpool, Offers. LiveOne20, the loyalty smartcard if offering a once-in-a-lifetime opportunity to see Sir Paul McCartney and friends live in concert at Anfield on Sunday 1 June. This spectacular multi-artist concert celebrates the unique Liverpool sound and how it changed the face of popular music for ever. This is your chance to join 30,000 for this one night only spectacular event. There is a 20% off Special Offer for Livesmart card holders, meaning all this can be yours for just £440 per person plus VAT, instead of £550. Which all goes to show, you can’t buy me love, but you can buy a great night out with Macca! Eh? See what we did there? Posted by liverpoolchamber in News, Travel. Train times for passengers travelling from and to Chester and Ellesmere Port change and Merseyrail is running more 6-car trains to increase capacity. The changes are a result of Merseyrail’s improvement plan to create a more robust and reliable service on the Chester line based on passenger feed back. The new service pattern means that Merseyrail trains from Chester now depart on the hour and on the half hour (at ’00 and ’30) towards Liverpool throughout the day. Departures from Ellesmere Port to Liverpool are at ’19 and ‘49 minutes past the hour throughout the day. During the morning and evening peaks additional trains will run from Chester and Ellesmere Port creating a 4 trains per hour service for commuters to/from Liverpool during the peaks. This is unchanged from the current frequencies during the peaks. The changes create more recovery time during the morning and evening peaks leading to better punctuality and reliability of the service. This announcement coincides with the re-opening of the front entrance of James Street Station after an intense programme of refurbishment. In response to growing numbers of passengers and in partnership with Merseytravel, more of the trains from Chester in the morning peak and to Chester in the evening peak will consist of 6-cars. This also applies to Saturdays when many Chester services will be formed of 6-car trains. Bart Schmeink, Merseyrail’s Managing Director said: “Passengers on the Chester line have given us a loud and clear message. And I agree with them; I want their trains to be as punctual and reliable as the rest of the Merseyrail network. Together with Merseytravel we have been able to respond quickly. The changes won’t just benefit Chester; they will also benefit all passengers travelling from and to South Wirral stations as there will be more 6-car trains for them as a result”. Posted by liverpoolchamber in Culture, Events, Liverpool, News. Do something different with your lunch hour. On Wednesday 21 May, Chamber Council member and renowned local artist, Terry Duffy will be giving free talks in the Walker Art Gallery at 1pm and 3pm about his exhibition ‘Standing Stones’. ‘Standing Stones’ will features a very new and fascinating diptych ‘Somewhere between life and death we make decisions 2008’. This diptych further demonstrates Duffy’s fascination in experimenting in oils on sheer ‘hot pressed board’ which he rips away creating dynamic shapes that suggest the human form whilst retaining ambiguity. ‘Standing Stones’ will be the first of a series of exhibitions by Terry Duffy to be held at various venues in Liverpool during its year as European Capital of Culture. ‘Standing Stones’, by Liverpool-born international artist Terry Duffy, runs at the Walker Art Gallery Liverpool from 26 April to 8 June 2008. Free exhibition brochure: To receive an exhibition brochure free of charge please email with your name and address to info@british-art.org.uk. Further information: Please contact Clare Sheppeard at The British Art and Design Association London: info@british-art.org.uk. Posted by liverpoolchamber in Culture, Events, Liverpool, News, Offers. Liverpool Culture Company has teamed up with The Beatles’ company Apple Corps and Cirque du Soleil to present the UK premiere of the documentary film ‘All Together Now’ on Friday May 30 at FACT in Liverpool. ‘All Together Now’ tells the story of the remarkable collaboration between The Beatles and Cirque du Soleil that resulted in the staging of LOVE, the spectacular show that is astonishing audiences in Las Vegas. The film presents dozens of revealing incidents and encounters. Using archival material as well as intimate interviews with Paul McCartney and Ringo Starr, Yoko Ono Lennon and Olivia Harrison, musical directors Sir George Martin and Giles Martin, and the show director Dominic Champagne, this feature-length documentary is an intriguing glimpse of the artistic process from within the creative circle. ‘All Together Now’ directed by Adrian Wills at FACT, Wood Street, Liverpool – Friday May 30 at 6:15pm. The DVD will be released later in the year. The following evening, also at FACT, Olivia Harrison and the Liverpool Culture Company stage a special tribute to George Harrison with a screening of ‘Concert For George’. This film captures rock music’s most celebrated musicians at The Royal Albert Hall in November 2002 paying tribute to one of their own. On a magical night, the first anniversary of George’s passing, the concert included stunning performances from Ravi Shankar and his daughter Anoushka, Eric Clapton, Paul McCartney, Ringo Starr, Jeff Lynne, Tom Petty, Billy Preston, Joe Brown and many others. ‘Concert For George’ directed by David Leland at FACT, Wood Street, Liverpool – Saturday May 31 at 5:00pm. Tickets will be on sale at the FACT Box Office on Wednesday 14 May, initially to FACT members (limited tickets) from 12.00pm until 6.30pm and then to all members of the public from 6.30pm. Drop in or call the Box Office on 0871 7042063. Fancy an evening of wine tasting and networking in the heart of Liverpool’s business quarter? Of course you do! This is a chance to join your colleagues at a networking event where you will be given the unique opportunity of enjoying a selection of wines from classical European regions pitched against the new style southern hemisphere wines. There will also be surprises in store on the night so book your place now! Posted by liverpoolchamber in Travel. Ormond Street will be closed at its junction with Bixteth Street from Monday 10th March for 3 days to enable Enterprise Liverpool to undertake reinstatement works to the carriageway and footway. There will be a signposted diversion in place for users of the Albany car park. Posted by liverpoolchamber in Liverpool, Travel. For those of us who drive through or into Liverpool city centre, here’s a final reminder of the changes happening to the direction of traffic flow on North John Street and Stanley Street and the impact on surrounding streets. Click more for the full details.